Now that the NBA lockout is over, the Charlotte Bobcats are getting back to the business of basketball. The team signed their top draft pick, guard Kemba Walker, over the weekend and I'm sure the former UConn star is happy and relieved that some NBA checks are on the way. I know it had to have been tight for rookies like Kemba who haven't been able to get paid by the teams that drafted them in June. But I'm sure a lottery pick like him didn't have to resort to Ramen noodles, thanks largely to the endorsement deal he signed with Under Armour in July. It's an interesting fact that our city's top two rookies--Kemba from the Bobcats and quarterback Cam Newton of the Carolina Panthers--both have endorsement deals with Under Armour. It would be great if UA put up a billboard in Uptown Charlotte of the two of them. Who knows, that probably would've happened by now had the NBA lockout ended sooner and not have caused any loss of games the way the NFL lockout was able to be resolved before preseason. 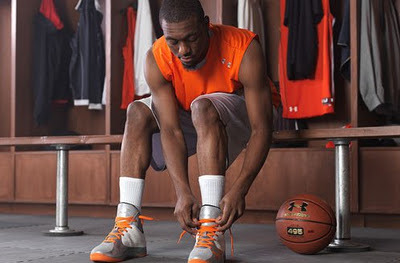 Because of the NBA lockout's long duration, it has sort of stifled a promotion Under Armour had planned for Kemba. The sportswear and apparel company was planning to commemorate the Bronx, New York native's homecoming, the scheduled December 10 game between the Bobcats and New York Knicks at Madison Square Garden, by releasing a special color of his sneakers. A limited edition of the PE "Homecoming" UA Micro G Jukes were produced in white/silver/orange. But all is not lost, Under Armour is going to hold the promotion to coincide with Kemba and the Bobcats' January 4 visit to the Garden. Under Armour released a previously shot promo video over the weekend, though it still refers to the original December 10 game.